How Does Rent to Own Work? Don't Get Scammed, Learn How Now! How Does Rent to Own Work? Don’t Get Scammed, Learn How Now! First, it is important to mention that there are several different terms used to describe rent to own. All of these terms are basically referring to what we are calling a rent to own home. Your geography usually has the largest affect on which term buyers and sellers use to describe the transaction. There are a few variations that you and the seller can choose from, and we will explain them in more detail later on. While searching for information on how rent to own works, you probably found some articles with horror stories about people getting SCAMMED. But, you might be surprised (after reading this) at how powerful and simple this option can be for you. Also, you will notice that victims who get scammed and lose money are usually committing the same few mistakes. Later in the article you will see the critical step you must take to succeed. The main difference is, the seller agrees to give you the option to purchase the house in addition to renting the home to you. This is technically referred to as an Option to Purchase. Also, instead of paying the normal rental deposit to the landlord, you will instead pay a fee called an Option Fee. The option fee is paid upfront and is non-refundable, in the event you don’t purchase the home. But, the option fee does go toward the purchase price of the house when you purchase down the road. The amount is usually 3-7% of the purchase price, but this is completely negotiable. The option agreement states a purchase price that you and the landlord mutually agree upon, and is signed along with your rental agreement. The option agreement also details the period of time the seller is willing to give you to purchase the house. This length of time is called the option period and it’s often 12-24 months… but can even be 5 years or more. This option agreement is one of the most important agreements contained in the rent to own paperwork you sign. What if I Fail to Qualify in Time? The contract expires and you no longer have the legal right to purchase the property. Further, you forfeit all rent credits(explained below) and the option fee paid to the seller. The option agreement may offer you the ability to extend the agreement. If this extension is offered, it typically requires a small fee and/or criteria you must meet. For example, a seller may require that you are currently qualified for a mortgage and in the closing “process,” to qualify for the extension. If you’re serious about buying a home, here is the MOST important step: You absolutely need to begin improving your credit right away. But, with rent to own you NEED to qualify to purchase the home within the 12-24 month option period! You don’t want just anyone handling your credit, that’s why the professionals at Cake Credit Repair have our vote for the best credit repair program available. We especially appreciate Cake Credit Repair’s focus on personalized customer service, something you won’t find at the credit bureau offices. You’ll get one-on-one attention, which is only part of a comprehensive approach that makes them so attractive. We also really like the fact that they only charge a single low monthly fee without requiring any upgrades. One price covers everything needed to clean up and restore your credit. If your spouse needs credit repair, you can also take advantage of a discount for spouses when you sign up together! We could go on and on about Cake Credit, but I think you get the picture. If you find ANY company you feel is better, please let us know by contacting us! Rent credits are common with a lease to own house. It is the portion of rent that’s credited to the purchase price each month the rent is paid on time. Do not expect to be given a credit if you pay your rent late! The credit amount varies depending on how negotiable the seller is. When you are moving into your house, make sure the amount of the rent credits are stated in the option agreement. I am a homeowner and I am thinking of “rent to own” my house. Will I still be responsible for house repairs ? My fiancé wants to rent to own, but he has bad credit and is in the process of fixing it. In january he will have a good credit. Right now we are living in a condo were we had spoken to the owner of rent to own and him taking part of the rent for down payment.. He recently told us that he will sell this condo to some one else so the purchase will not go trough.. Is it hard to find any one who will sell on rent to own having a bad credit? we want to get out of here this month and search for a rent to own place. We are tired of throwing our money away, we pay 1,200 and it was just spoken that we would rent for 2 years and he would sell it to us. Hi. I have bad credit 512 but i was able to get a morgage for $20.000 it expired a month ago. I still want to buy a home for my 3childrenand i.. Im a single mother. I tryied getting a house with the morgage but it was just too much chaos with the morgage that i had to pay for them to go and do a inspection to this house and some other things. I own my movil home and i pay lot rent. I think this 3room movil home is getting too small for me and my children.. But i dont kno wat else to do i need help.. I have some money saved just in case i see a cash house fixer upper but i dont think that is possible with wat i have saved.. Pls help. Thank u.
Hi Cole, great info. I am looking for a rent to own in a certain zip code. At the moment the area has a lot of homes in foreclosure still not recovered from the recession but that is changing with some new investments in the area. My credit is not that good as I had some issues a few years ago. My questions where can I find good properties with offers? what is a good way to determine current market value of a home? I expect the home to appreciate because of the investments being made in the community. If it does can that be a part of the equation for purchasing the home? If so how? I know you are not a lender but what are ways or techniques I can employ to ensure I will qualify for a loan when the timeframe expires? Also is there language I can put in the agreement that gives me more time to qualify if I cant at the time? Al, thanks for the kind words. As for your questions, I will email you to discuss your questions further. hello cole, thanks for the idea, until now i still try hard to get our own home,but now it seems i know what to do..
Hi, we lost our home about 5 years ago and have been renting ever since; the home we lost still has yet to go into foreclosure so I’m guessing that we cannot purchase another home??? Since than we have repaired our credit and on our way to better credit score. How do I go about Renting to Own? Who do I call? and how can I determine if they are a legitimate company? Thank you in advance for your advise. Before working with someone on a rent to own, I would first speak to a local professional about your home that has yet to foreclose. You need to find out when the home will be foreclosed on and then how long you will have to wait after that to qualify for a mortgage. You don’t want to sign a two year contract on a rent to own home and later find out you can’t qualify for a mortgage for 2.5 years. 1. Is $1,200 the market rental rate (or slightly above) for this home? 2. Would the home appraise for $89,000? 3. Can the landlord verify they are the owner of record? b: Owners mortgage amount is less (or very close) than your purchase price. Question #3 also answers your question about landlord defaulting in their mortgage. Also, be sure this is a good long term investment for you (and your family) and not something you are rushing in to because of the landlord’s (possible) lack of credit/income/mortgage-ability requirements. Remember, if you are unable to qualify for a mortgage within three years you will be left with nothing. Hello, I am looking for financing to purchase the home I’m living in. The home is about $180,000. How do I find a private lender and what precautions to I need to take to protect myself from getting ripped off? Lisa, from my experience with private lenders you will be required to pay a large down payment and very high rates. I’m assuming your renting the home currently? What type of time frame do you have for obtaining the financing? It would be my first time buying a house and I want to know should we do rent to own? Joseph, This depends a lot on your unique situation. Please read more in our resources section for answers or use the contact us link to discuss your plans in more detail. Best of luck! How do you get info on a house you are interested on this website? It says broker 115550. OKCPS – You should be able to find contact information for the seller on the property details page, in the description section. If it’s not listed there click the link labelled “provided by” next to the main image. This link will take you to the original listing. I recently looked at a rent to own property. It was listed as just to rent or also for rent to own. The gentleman that I spoke with said it is $1050 for rent. I asked him how much goes towards the own part and he told me the base rent is $1050 and anything additional goes towards the down payment of the home. He is basically my saving account for my down payment. If I gave him $1350 a month he would put $300 towards the down payment. This does not seem right to me. I always thought it was a percentage of the rent price not just me giving them more money. Is this legal? @Dbosley – This is a common response from a seller who is willing to offer their home for rent or rent to own. In this case DO NOT offer to pay extra money each month toward the down payment. Just save this extra money yourself because if you can’t buy or decide not to but, you will still have your money! The important number to ask the seller about would be the selling price. Is the price they are willing to sell for close to fair market value? If not, move on! When someone finds a home with the option to rent to own, does that person absolutely have to obtain a mortgage? Our credit is not that great since my husband was a victim of identity theft a few yrs. back. We still have problems just renting. I had no problems until we were married because his identity was stolen before we met! I am at my wits end & don’t know what to do. We have been in circles with the credit agencies & they know everything, including the 2 men that stole his identity & went to prison for this crime. Still he lost his very successful business & all his great credit. We have already been scammed by a property owner at a condo complex in which the property manager offered a nice, clean, beautiful condo that was in a “certified” crime free area. The place was a real dump! It is certainly not livable or crime free! We have been there 1 month & our new SUV was stolen right out of our back lot which is in a gated community, however the gates stay open! We are still paying rent but not living there. It is so noisy because it is right on one of the busiest streets in the city! The idea was to possibly rent to own this condo, now we are suing just to get out. My husband & I are both disabled & together bring home a little more than 1800 a month. I just do not think we would ever be able to get a mortgage. I have never been late on rent, served with any type of papers like eviction, or ever had a complaint against us. It is just the opposite with us, we pay @ least a month ahead & we are clean, quiet & very likable people. Our parents are aging & want to help however they can. They know of all that has happened & wanted to build us a house (with us paying for it of course, the only thing is they want to build it on their land which will be sold when they pass away, I thought that this would just be a waste of money & time. Any advice on what to do? What if this had happened to you? What would you do as far as buying a home. My in-laws have even offered to help get the mortgage to help, but what would happen if they did so & then passed away? Would we lose that home as well? What if they co-signed for us or for me alone? Any advice would be greatly appreciated. By now, I fairly certain that you’ve gotten your home and have received multiple answers to your questions which I’m just seeing for the first time today. The solutions are fairly simple as you have several avenues with which to resolve them (parent’s help, land, etc.). However, if you still need answers, please feel free to contact and I’ll respond as quickly as possible. When i started renting 6 yrs ago my landlord said it was rent to own. As of today he wont talk about it. How do you go about finding out if you can buy it or not? I thought after so long you should have a chance to buy. I own a house that is worth about $230,000. I currently have it rented for $1300 per month. 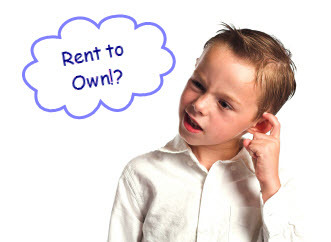 Recently, my renter asked if I would be open to a rent to own agreement. What would be your suggestion on how to set this up and what the monthly payment should be? I really had not considered do this, so I was caught off guard. I am not desperate to sell and the house is located in an area where values are expected to begin climbing again. It depends on many factors that you specify on the note. Great information on here!!! Thank you! HI Cole, me and my partner are looking at a rent to own property as our credit is less than perfect. My querrie is can you make extra payments toward the purchase price on top of the rent? And why are rent to own properties doudle the regular rental price if none of it actually goes toward purchasing the property? I wouldn’t recommend paying more money each month to pay down your purchase price until you actually own the home. This way you aren’t putting out any extra money each month that you could possibly lose if you fail to qualify for a loan. When you ask why are rent to own homes “double,” I’m not sure if you are referring to the rental amount or the sales price. But, you should be negotiating or avoiding homes that are on the market for double their market value. Lots of good info. I have a home on the market. No offers in the past 9 months. Prices reasonable. We had it rented but there were always complaining about something. Got an offer for rent to own. Tried this with the othe tenants but we only got $650 for the deposit. What is a good time period and good Option amount to ask for? We have it listed at $69k and we had it rented for $650 last time(which is good). Any help would be appreciated! I have very good credit. Home loan is not a problem for me. My problem of buying a home is that I don’t know how long I’ll stay in this city at the moment. I do like to buy a home right here though. So do you think rent-to-own home is a good option for me, because I COULD walk away if I have to move in the next year or two. Am I right? Thanks! the option fee is it deducted form the asking price of the house and is it then the sellers to keep(spend). Is it the sellers resonpsibility to save the option fee as well as the rent credits until agreed term is up. I have been approached to rent to own my home but need the money to purchase another maybe this is not the option for me, but my house has been in the market for awhile and this is the only offer i have recieved, not sure what I should do want to get out of this house it is to small for family now but dont want to rent and lose money that way, I quess no brainer just lookin for another view. You are correct, the option fee is deducted from the asking price of the house and is non-refundable(unless agreements state otherwise). Usually this is a good option for a homeowner who is offering their home for rent because they can’t sell. From your remarks it seems renting is not an option for you, so using a rent to own probably wouldn’t be either. Cole, correct me if I’m wrong, but are these homes/condo’s primative units with no Fridge, Stove etc? No working utilities initially? Also, if the location is within a community/building, what about the Association fee’s?? Ryan, I’m not sure if you are referring to a particular section of rent to own “homes/condos” in your area or in general. But, a “traditional” home offered as a rent to own is exactly the same as a rental home. Owners are using this strategy much more often today because the market is slow. You see, the majority of owners who need to sell their home are looking at a very long “holding” period if they want to sell at a retail price. I just read an article HERE that claims the national average for days on the market is 258! Many owners can’t afford these holding costs while waiting for a retail buyer so they will offer the home for rent. Homeowners who understand the concept of rent to own will market their house this way and usually get a much higher response. Because this offer is basically saying, we want to sell the house when we can, but we will allow someone to lease the place until they are able to qualify for a mortgage to buy it. My husband and I are in the process of searching for a rent/lease to own property. We already know our credit isn’t in the shape it needs to be to outright buy a home, so we felt this would be our best option but now I’m not so sure. Any information you have would help us greatly. A rent to own can be setup just like a traditional rental home. When the market was strong sellers could attract families with bad credit to “rent to own” with huge amounts of money upfront in option fees. In today’s market, a family that wishes to buy a home but they need 2-3 years to rebuild their credit can likely find a house listed for rent and convince the owners to give them an option to buy the home for close to nothing. I wouldn’t say that is normal but if buyers take the time to learn the steps involved with rent to own then a great deal is very possible. Remember, you have the OPTION to buy, so if you are unable to qualify for some reason or want to back out you are not obligated to buy.